Disclaimer: All information provided on this site is publicly available. Start development now and build your own OpenGear! OpenGear is meant for developers to get a head start in GearVR™ development without waiting for it to be available in their country. OpenGear is completely open source. We believe an open developer alternative will make it possible for everyone to create enticing content, even without having the consumer hardware. It is very easy and cheap to build an OpenGear yourself. Scroll down to find detailed instructions or register your interest in a pre-built kit. OpenGear works with the current Oculus Mobile SDK 0.4.0. However, we cannot guarantee that Oculus won't change this in the future. OpenGear emulates a compatible head tracker and can be used with any GearVR™ app (at the time of writing). This means you can test your own app, use Oculus Home, browse and download new apps from within OpenGear and even enable the pass-through mode. OpenGear does not seem to trigger the switch into the low persistence mode of the screen correctly (even though it should). We are working on enabling Low Persistence at the moment. The tracker has a much lower update frequency. You wouldn't get the buttery smooth 1000Hz of the real thing, but it is enough for app testing. We have also experienced a bit of drift, but much less than we encountered on Cardboard apps. OpenGear does not have a touchpad, mainly for the reason to keep cost down. However, you can use any Bluetooth mouse or touchpad for the same functionality. A small modification to the manifest file of your app is necessary in order to be run outside of Oculus Home. Build your OpenGear - it is cheap and easy. It won't be like the real thing, but it will enable you to test your app. Since OpenGear emulates a compatible tracker, it relies on the underlying software. You will need a GearVR™ compatible Note4 phone with the latest updates for OpenGear to work. 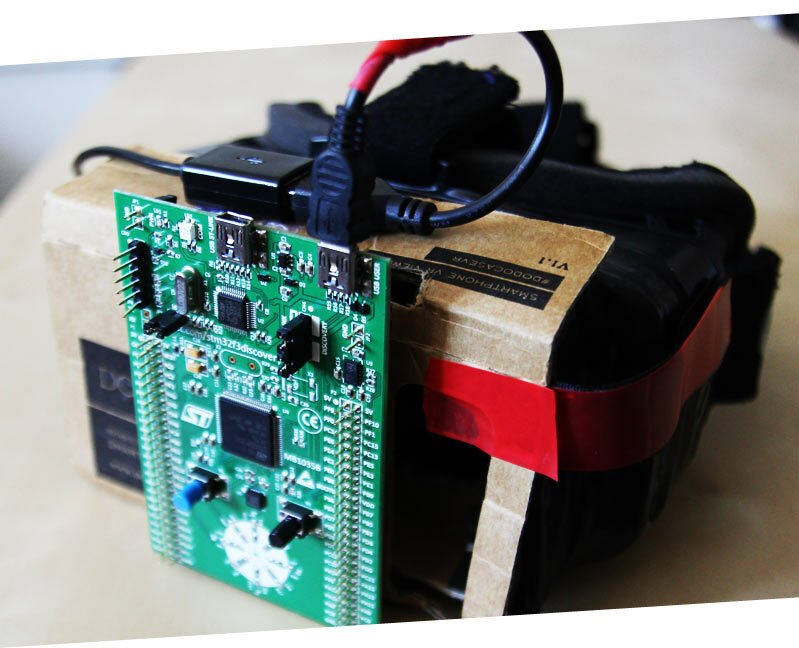 This board contains the IMU and has been used in many DIY Rift projects. We will be using this board to emulate a DK1 tracker, which is compatible with the current mobile SDK. We have to connect the IMU with the phone via this cable. If you prefer a more modular solution, just go with an USB Host cable and a standard Mini USB cable. If you plug a DK1 into a Note4 via an USB Host cable, it recognizes it as a valid tracker and will enable head tracking. Build your Case/Phoneholder. We will be releasing Note4 compatible cutting templates soon. But why stop here? You just build a GearVR™ compatible device. Launch Oculus Video 360 (which comes with it's own icon ont he Android Homescreen). Connect a bluetooth mouse to your Note4. The Left mouse button will be the tap, the right mouse button will be the back key. You can even drag the mouse to emulate the swipes. Long press the right mouse button to go to the config menu. You can enable passhtrough mode or even start Oculus Home from there! We understand that many developers are great at software but don't necessarily want to get their hands dirty in hardware. We are still evaluating the possibility of offering a pre-assembled development kit dubbed "Midnight Sun". as well as the pre-flashed IMU attached to the front and an USB cable. We will sell this kit at cost. We won't earn any money from it. If you are interested in a Midnight Sun kit, please register your interest in the following from. Thank you! Visit us at VR Bits to see more cool stuff. Copyright © 2014 The OpenGear Project. All Rights Reserved.